The Chimpanzee is native to West African Coast from Senegal, to Central Africa all the way to Uganda. In 1900 there were over 1 million chimpanzees in the wild, today we have as few as 340,000. This shows clearly that the African Chimpanzee is endangered and it took one Dr Jane Goodwall who came to Tanzania from England at age 26 with a fascination for wildlife. She ventured into the world of chimpanzees only to discover the survival of the species is threatened by habitat destruction and illegal trafficking. An increase in bush meat trade, commercial logging, illegal wildlife trade in Central and West African countries has led to habitat loss for these animals. This leads to an increase in smuggling of chimpanzees to be used as pets. There is high demand for these animals especially in China who buy the animals as pets for their entertainment spots in malls and circuses. The older chimps are killed for bush meat and the little babies left behind are smuggled off to be raised as pets. Babies are preferred because they are easy to smuggle, train and handle as compared to mature chimps who are known to be stronger than humans. Babies are cute and playful though they start to change as they grow up and their wild instincts start to kick in. This results in them being caged or chain as they are not easy to control which eventually hinders their growth. Dr Jane Goodwall started a chimpanzee rescue center in Burundi but due to the civil war that heat the country in 1993, it had to be closed. After consultation between Jane Goodwall Institute, Kenya Wildlife Service and Ol Pejeta Conservancy, the Sweet waters Chimpanzee Sanctuary was established. The Sanctuary aim was to provide a long life refuge for orphaned and abused chimpanzees from their native home; West and Central Africa. Over the years, the sanctuary has accepted chimpanzees rescued from traumatic situations in different parts of the world. So far they have 35 chimps rescued from cramped and unnatural living conditions most arriving in the center with injuries sustained from abuse in the hands of humans and through care and treatment, they a given another chance to live as wild animals. Poco is 38 year old chimpanzee living in the sanctuary after being rescued from Burundi. He is among the first to be rescued. He is a victim of illegal trade having being rescued from Bujumbura, Burundi where his captors used him to attract visitors while being kept in a small cage. He spent nine years of his life in a small cage suspended above a workshop with very little space, he was only able to sit and stand on two legs which is unnatural for chimpanzees. His pelvic muscles were so underdeveloped due to this position and most of the time walks like a human being. After years of rehabilitation, he is slowly adjusting to the ape like structure. Manno is the youngest and most recent rescue who is only 7 years old. He was rescued from Iraq and brought to the sanctuary in November 2016. Manno was rescued after a two-year campaign for his release from a zoo where he was kept as a pet. The campaign was constituted by the fact that Manno was being fed on an alien diet not suitable for chimps which included a lot of junk food and cigarette from visitors and this gave him constant diarrhea. This was accomplished after the intervention of Kurdistan Prime Minister who ordered him to be transferred to Sweet waters. At the sanctuary, the chimps are given 24hr veterinary services. They are first kept in a simulating quarantine enclosure and carefully nursed back to health. When ready, they are introduced back to the large group who live in a natural enclosure. They have set feeding time and return to their enclosure at night after spending the day exploring, climbing, socializing and acing like chimpanzees should. Bleeding is not allowed in the sanctuary as Kenya is not their native habitat and the chimps depend wholly on being fed. They normally use contraceptive to control bleeding though this does not work on all chimps and some have given birth in the sanctuary. Sweet waters is a chartered member of Pan African Sanctuary Alliance. Its role is to help conserve chimpanzees and other primates plus their habitat through public education and lobbying for political goodwill. The alliance has 18 sanctuaries in 12 countries in Africa currently caring for over 800 orphaned chimpanzees. A lot of money goes towards the care and rehabilitation of these chimps and sweet water is always ready for donation for this cause. 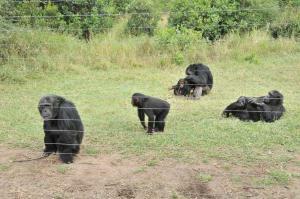 Sweet waters is a tourist destination in Kenya and all proceeds this goes back to care and rehabilitation of the chimps. They also encourage visitors to adopt or sponsor a chimp and also offer education on conservation and awareness on illegal chimp trafficking. Story courtesy of Ol Pejeta- Sweet waters. Hi Anita, Thank you for this post. I found this very interesting to read and don’t like to hear of animals being mistreated by people. I really think that there is no need for people to do these things. I was saddened to read about poor Poco. That must have been so sad to see him stuck in that cage. I am so glad he was rescued and is now slowly adjusting to the proper structure for an ape. Well done to Dr Jane Goodall on being able to get these centres set up. It is a pity that the first one had to close but if it hadn’t then the Sweet Waters Sanctuary would never have materialised. I also used to think it’s cute to see chimps dressed as kids or smoking and thought i should get one for myself. It was until I learnt of Sweetwaters and what they do. I didn’t know chimps are illegally smuggled and that making them live like humans endangered their health and denies them the chance to exercise the freedom of being an ape.